You can search Bing on Free Basics in Ghana, but you cannot access any of the websites in the search results, unless they are part of the Free Basics package. Screenshot by Kofi Yeboah. Across the world, efforts to increase internet access are wide-ranging — there is everything from public-private infrastructure development, to community-built mesh networks from Oaxaca to Cape Verde, to WiFi-emitting balloons flown by Google. Another effort is Facebook's Internet.org project, which the Silicon Valley company describes as an initiative to bring internet access and the benefits of connectivity to the portion of the world that doesn‘t have them. The flagship product of Internet.org is a mobile app called Free Basics, which gives users access to Facebook and a handful of online services, such as Accu Weather, BBC News and Wikipedia free of charge. Free Basics is available in 63 countries, 26 of which are in Africa. Facebook partners with mobile telecommunication operators who provide this extra data that allows subscribers to access the Free Basics app. Most of the featured sites are based in the US or Europe. The only local and local versions of services featured on the main screen include the e-commerce site Tonaton Ghana, the job search site Jobberman Ghana, Super Sports, and the news sites Ghana Web and Ghana News, both of which tend to feature repackaged stories that have already been reported elsewhere. 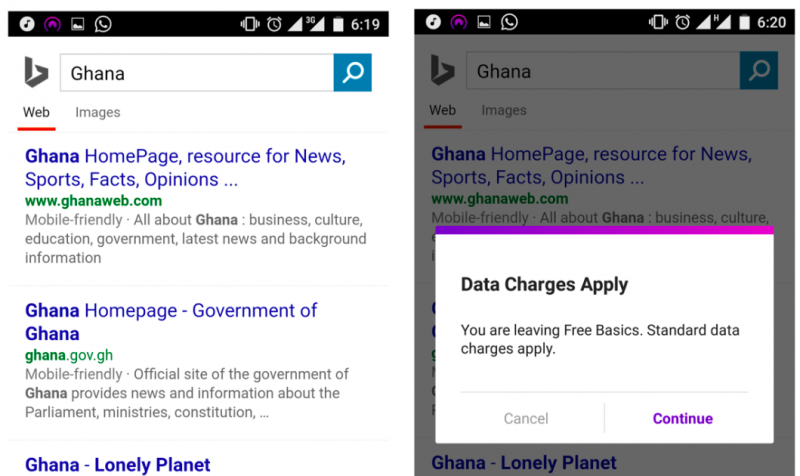 The Bing search engine is also available in Ghana, and on most other versions that we tested. Of course, it has limited utility, given that nearly all links that appear in search results are inaccessible for the user. When a user tries to select a link from Bing search results, they are met with a notification that reads “Data Charges Apply.” If the user does not have a data plan, they are unable to access the selected website. A larger set of apps, ranging from learning apps to sports and entertainment sites, can be found on a separate page a few clicks beyond the main screen. Nearly all of these sites are based outside of Ghana, and many of them outside of Africa. When using the websites that are available on the Free Basics app, subscribers do not get full use of these websites. For example, if a user wants to use the Facebook app within Free Basics, they will not be able to access pictures or watch videos on the app. 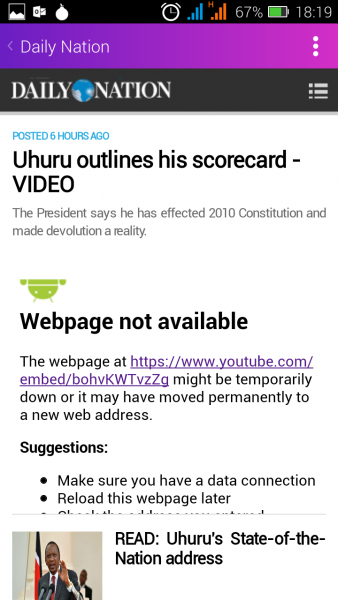 News websites remove videos, including the Daily Nation in Kenya, pictured here. Screenshot by Njeri Wangari. If a user encounters a video or image on a news site, these too are often removed from the screen, as demonstrated in the image above. Users are notified by the app that they must pay data charges if they want to view a picture or watch a video on the Free Basics app. 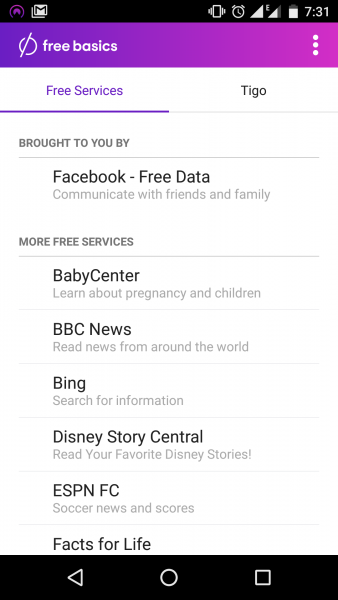 The Free Basics app provides its users limited access to websites and other important apps. It does not offer access to any government or public service websites, nor does not offer services from Facebook's main competitors. For instance, Free Basics has no Twitter app. It also does not include an email app. 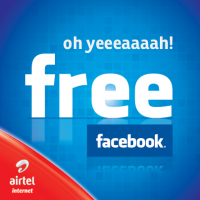 Free Facebook ad, by Airtel. Since its inception, Free Basics has raised lots of concern about net neutrality, an industry term used to indicate that anyone from anywhere around the world should be equally able to access or provide services and content on the internet. In short, it means that in a truly open internet, all content is treated equally. The corporate interests at stake in the Free Basics program are difficult to ignore. Apart from the interests of Facebook and the handful of sites and services offered on the app, telecommunications operators also benefit from Free Basics. Previous reports by BuzzFeed News told us that telecommunications operators — not Facebook — are covering the actual cost of providing users with mobile data that allows them to access the Free Basics app. Local advertising campaigns and even comments from telco employees indicate that Free Basics has served as a way to drive new subscribers to their network by enticing potential subscribers with the promise of enjoying free access to Facebook. If indeed, if Facebook wanted to improve the knowledge of people across the globe, especially in developing countries, they would open their platform to include more languages, enable key features like pictures and videos — a great and dynamic medium for sharing and improving knowledge — and allow users to access more information from across the web. This post reflects the position and findings of Kofi Yeboah as an independent writer and researcher. It does not reflect the views of his employer.